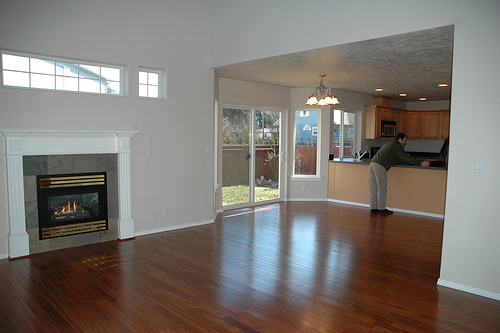 Cherry hardwood flooring is one of the most beautiful domestic flooring options. It takes a modest but diligent investment to keep them in excellent condition and to avoid the need to refinish them after time. You should attempt to take the time to observe your flooring closely. In order to determine the maintenance it needs, pay close attention to little signs of neglect that need to be remedied. Even as important is understanding how to prevent damage so that there is less upkeep needed and so costly repairs and refinishes can be avoided. One of the benefits of solid wood flooring is that it is rather easy to clean in comparison to other flooring options. To help your floors maintain their charm there are daily steps you can take. Some of the main culprits are sand, dirt and grit. Such abrasives are a hardwood floors ticket to scratches. They also dull the finish and can even dent the wood itself. In high traffic areas and entrances, it can help to place rugs or mats down to help prevent damage. Just as damaging as grit is standing water. Never let a spill air dry on hardwood. The old saying, “it’s only water”, is simply not applicable. Leaving spills to sit on hardwood flooring can cause warping and discoloration. Granted, those issues are greatest when a floor has a substandard finish but in all cases it is inadvisable. Not all cleaning agents are going to be appropriate for wood. It is a natural material so mild is best. Any and all oil soaps should be completely avoided. They have a tendency to build up. As oil soaps build they prevent successful application of maintenance coats. It is far better to utilize a cleaner that has a neutral pH and is made especially for hardwood floors. If it is necessary to move furniture over your hardwood flooring attempt to lift it fully. In all cases, padding between the floor and the furniture legs can aid in scratch prevention. Along the same lines, when you vacuum be sure to use the brush attachment. Brooms should be of a fine comb with widened ends, but it is better still to use a dust mop. Dust mops are best with a cotton head and when spray treated at least 24 hours prior to use. A lesser known issue is the sun. It will cause discoloration of the wood. Sheer drapes in direct daylight will allow a sunny feel without risk to your flooring. With all these things in mind your Cherry hardwood flooring should look beautiful for years to come. It is worth the minor hassle to keep them in good condition as refinishing and repairs can be costly.